just a quick peek at the a piece of the front – a layer of painted white cotton jacuqard stitched to a plain white cotton twill. I’ve been inspired by jude’s efforts to try this month all by hand. Go see her stuff now – it is always inspirational. I agree..I love hand work, but it takes a mind set not to say, ‘hey I can do this twice as fast on the machine’…love your effort here, very nice..
liking the contrasts a lot. 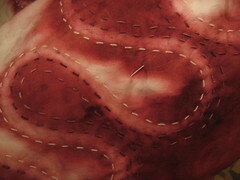 Hand stitch hurts my hands whatever thread I use, but it’s worth the pain!